Last Sunday was the Santa Claus parade in Toronto. I have a lot of fond memories surrounding the parade broadcast on TV. My brothers and I never actually paid much attention to the parade, but we did pay plenty of attention to the Rice Krispies Treats and Hot Chocolate with marshmallows. It was somewhat of a tradition for my mother. Just before the parade started my brothers and I would surround the stove waiting for the warm pan of treats to cool, fighting over who would scrape down the bowl. Yeah, Rice Krispies Treats aren't anything fancy, but they're so good. When was the last time you had one? Now, to be fair, these aren't your standard Rice Krispies treats; I went and made them complicated. There was a point as they cooled that I was convinced they were going to taste awful. I was ready to create a new recipe tag for the site called “Epic Fail” thankfully this did not happen :). 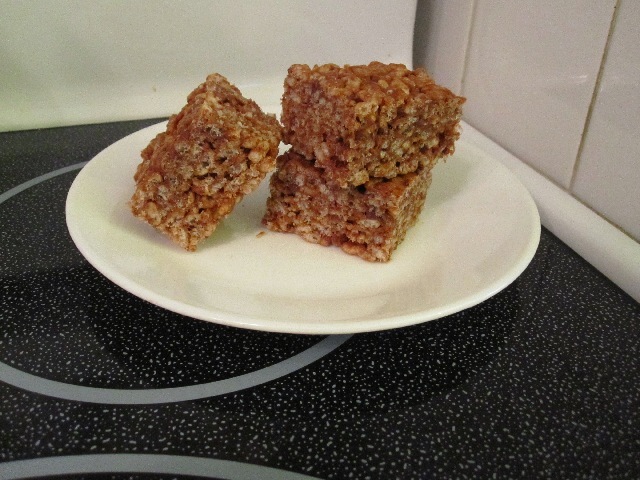 First I started with a winner: the 80s version of the Rice Krispies treat. The difference between then and now? Then: 4 tablespoons butter to 4 cups marshmallow to 5 cups cereal; now: 4 tablespoons butter to 5 cups marshmallow to 6 cups cereal. That's a huge difference (the difference in the “American” recipe is worse 3 tbsp butter to 4 cups marshmallow to 6 cups cereal, apparently we like more fat and sugar in Canada :)). But I couldn't stop at the basic treat, I've done that one before. Next step was to add Peanut Butter, not an unusual addition. No, where I thought I was experimenting was the reduction of the butter by half and its unsweetened chocolate replacement. I chose unsweetened because butter itself has no sugar and I didn't want the treats to be any sweeter. As I spread the finished mix in the pan to cool, I tasted a few “crumbs” and that's when my concern started. However, I did manage to lessen my fears as they cooled. By doing some googling, I discovered that many people add cocoa powder to their Rice Krispies treats, so I should be okay. My fears were completely demolished when I walked up stairs as my Father ate one. He looked at me, pointed at the treat in his hand, and said “This... is good.” My father being forthcoming about anything is a revelation and for once I agree with him on something, they... were good :). These Rice Krispies treats had a very balanced flavour, not too chocolatey, not too peanut buttery (not possible), not too sweet, and not too dry. Actually, I'd say they were less sweet than a normal Rice Krispies treat, no doubt because of the chocolate, and this made them extra good (to me). The flavour was kin to a sugar reduced Reese's Pieces or peanut butter cup. Or If you have ever had the Reese's Puffs cereal, it's close to that as well, except better. With those I find that the cereal and chocolate overwhelms the peanut butter flavour a little too much. But chop up some of these Rice Krispies treats, dump in a bowl, pour in some milk, serve for breakfast, and I'm all in. Sure after a few mornings I'd probably drop dead, but what a nice way to go :). Line a 9” pan with parchment paper leaving an over hang on two sides (Amusingly, American recipe: prepare with cooking spray; Canadian recipe: prepare with butter :)). In a medium pot add peanut butter, butter, and chocolate and turn burner to medium-low. Stir constantly until all ingredients are melted. Once melted, add vanilla and salt and stir to mix. Add marshmallows and continue to stir until completely melted. Remove from heat and add cereal. Stir and fold until mixture is combined. Spread mixture into prepared pan and set aside to cool. Try very hard not to eat while still warm :). We still had Cheerios to use up. Wait so you made Rice Krispies Treats with Cheerios ? PB and Chocolate Cheerios Treats? I'd eat them :).